UMBC’s Weihong Lin is helping to close a major gap in knowledge about e-cigarettes, with a focus on flavorings. The National Institute for Drug Abuse has awarded Lin, associate professor of biological sciences, a two-year, approximately $400,000 grant to supply much-needed objective data that can help inform regulation of flavorings in electronic cigarettes and protect the consumers of today and tomorrow, especially children and teens. The dangers of nicotine are fairly well understood, but today’s e-cigarettes also include ingredients that are not well known. “A primary concern about e-cigarettes right now is that they use a huge number of flavoring components,” says Lin. A 2014 study found that 460 e-cigarette brands used 7,760 different flavorings. It also connected “e-juice” flavors—from “cotton candy” to “double chocolate”—to a rise in e-cigarette use by young people. Rishit Patel ’19 (left), who received an Undergraduate Research Award to work on the e-cigarette flavoring project; Kayla Lemons (center), Ph.D. candidate in biological sciences; and Weihong Lin (right), observe tissue under the microscope. Scents and flavorings “tap into our mood and our motivation,” Lin explains. She also notes that the feelings that come along with scents and flavors can actually pose challenges to doing research on the safety of e-cigarettes. The positive emotional associations people have with certain aromas and tastes, like eating cotton candy at an amusement park or coming home to the smell of chocolate brownies in the oven, can override the warning sensations caused by high levels of artificial flavorings or nicotine, says Lin. This means that asking people about irritation levels in their mouths and throats after using e-cigarette products with familiar or pleasant tastes may not provide an accurate picture of e-cigarettes’ actual negative effects. 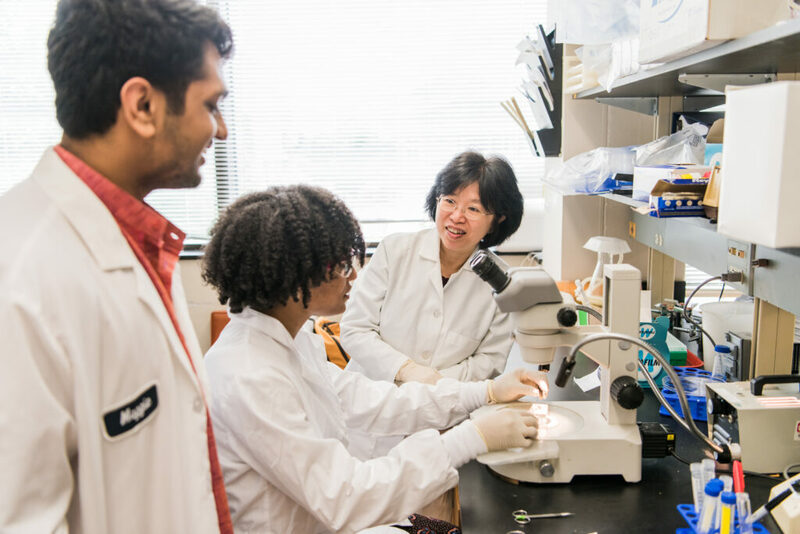 Weihong Lin (left); Ashley Majekodunmi ’21 (center), biological sciences, and a UMBC STEM BUILD Trainee; and Abdullah Al-Matrouk (right), a Ph.D. candidate in biological sciences, process mouse neural tissue. To push past that mask, Lin will go to a deeper sensory level, with the help of sensory systems in mice’s nasal passages, which are responsible for the sense of smell and detecting airway irritation. Lin’s group will study popular flavors used in various electronic cigarette liquid brands. The results could inform future regulations on chemicals used as e-cigarette flavorings. Lin hopes to eventually extend this work to also explore the longer-term effects of low-dose exposure to these chemicals. As a neurobiologist, Lin says, “I’ve always been curious about how chemicals affect humans’ daily choices,” from the foods we eat to the people we choose to date. But this current research project is also personally meaningful for her, as a teacher of young people. 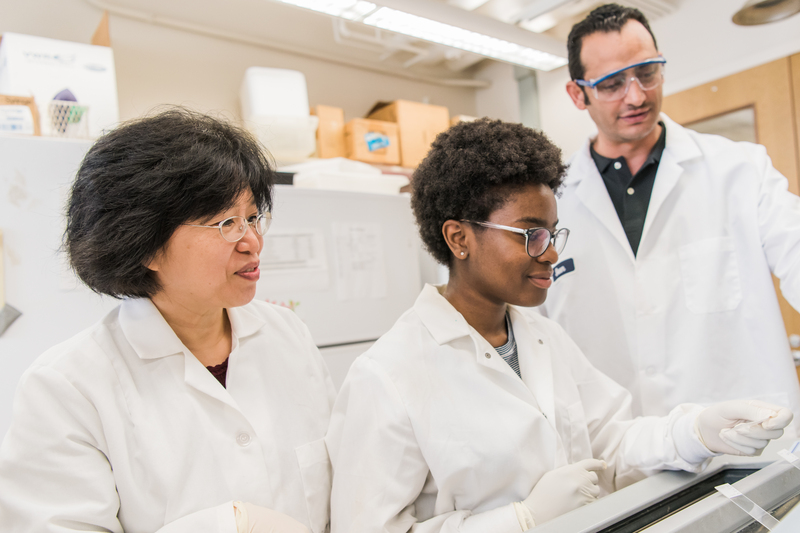 Banner image from left to right: Kayla Lemons; Avantika Krishna ’21, biological sciences, and a UMBC STEM BUILD Trainee; Abdullah Al-Matrouk; Ashley Majekodunmi; Tatsuya Ogura, research assistant professor in biological sciences; Weihong Lin; Rishit Patel; and Mark Gabriana ’19, biological sciences. All photos by Marlayna Demond ’11 for UMBC.